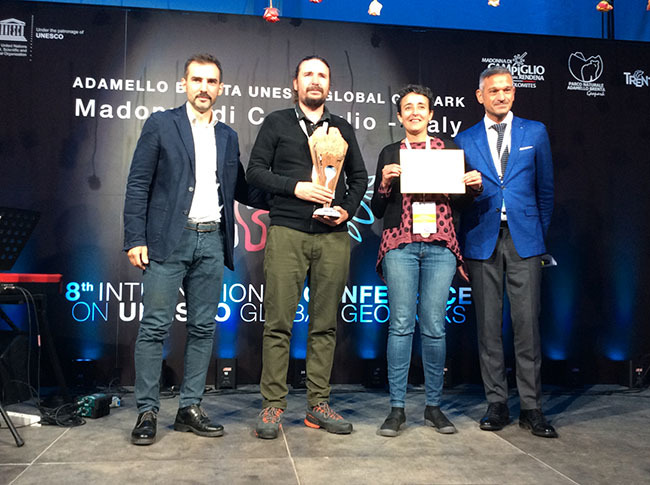 The Award Ceremony was held during the Gala Dinner of the 8th International Conference on UNESCO Global Geoparks in Adamello Brenta UNESCO Global Geopark on September 13th 2018. The announcement was followed by a certificate and a trophy made by school children with special abilities. 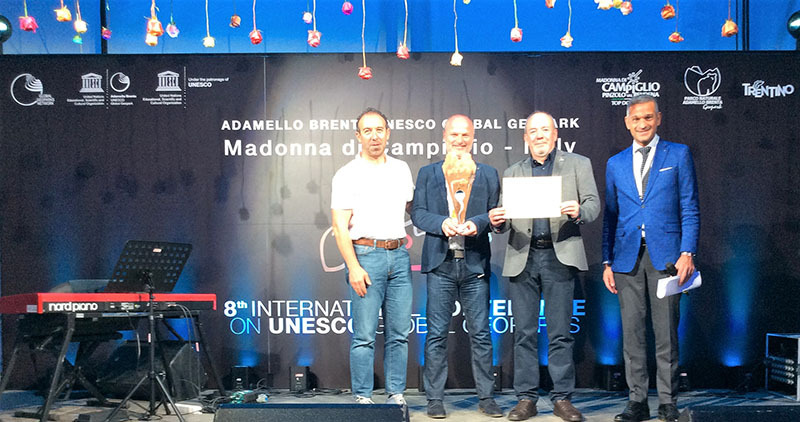 Adamello-Brenta UNESCO Global Geopark will be awarded as 1st Best Practice for its education and school co-operation programme. According to the Evaluator’s observation the Geopark is collaborating with all schools of the area (infant, primary, secondary and high schools) and some schools outside the region, involving around 10.000 school children in 2016. Therefore, Adamello-Brenta UGG is practicing an authentic, unique, sustainable and very efficient long-term co-operation programme with local primary schools. Through this educational programme all children growing up in the Geopark area are continuously getting Geopark lessons about geological basics, wildlife, nature protection and principles of sustainability. The children of the Geopark area are provided with a special comprehensive folder with a collection of proved Geopark worksheets accompanying them through the 6 years of the primary school. Teachers are trained continuously by the Geopark staff to be part of the system. Outdoor activities and children’s presentations are complementing this commendable educational school programme. 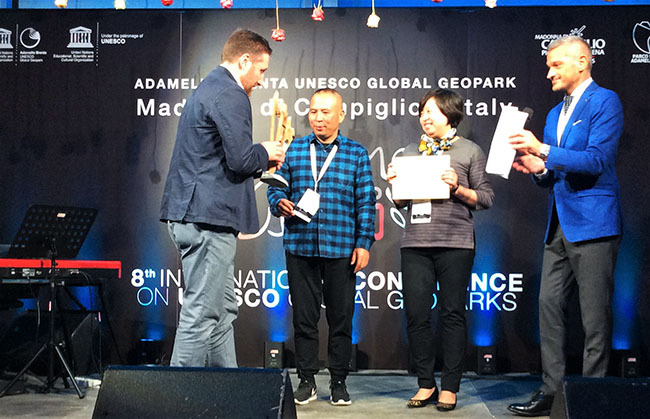 Zigong UNESCO Global Geopark will be awarded with the 2nd Best Practice for its Geo-partners in Geotourism and especially the Shisun valley eco-green tea base. Since the Shisun Valley became part of Zigong Geopark, the geopark management body made a partnership with the local enterprise of “GREEN•TEA•SPRING”in order to promote the high quality green tea produced in an ideal environment. According to the Evaluator’s observation the geotourism and ecotourism base offers a new experience for visitors in Zigong, combining the local geology with the traditional tea culture. We are impressed by the quality of the tourist services as well as the active involvement and support of the local community to the activities of the Geopark and the strong connection between the Geopark and the local guides. 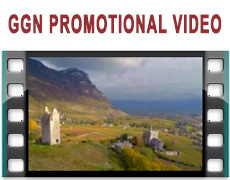 The geotourism and agrotourism experience is without any doubt a model to follow for other rural areas in Geoparks. 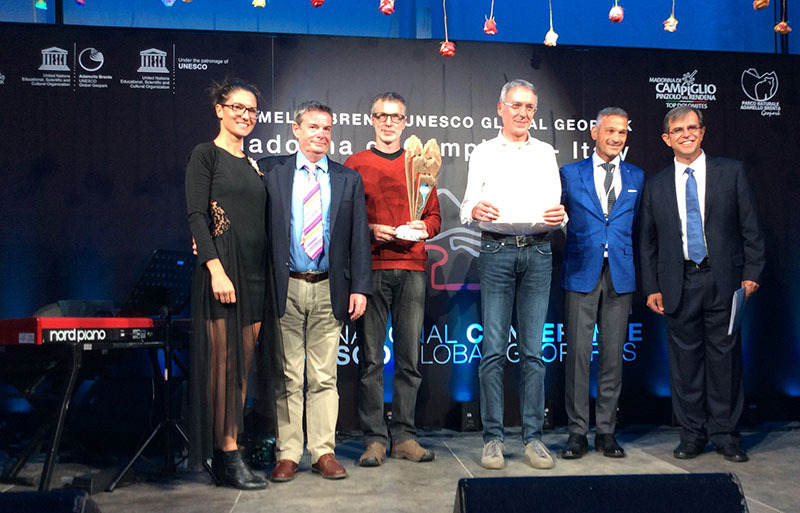 Las Loras UNESCO Global Geopark will be awarded with the 2nd Best Practice Award for its Geo-partners and especially the Geo-bakery that sells breads in the shape of the local fossils, creating a special link between the geological heritage and local products. 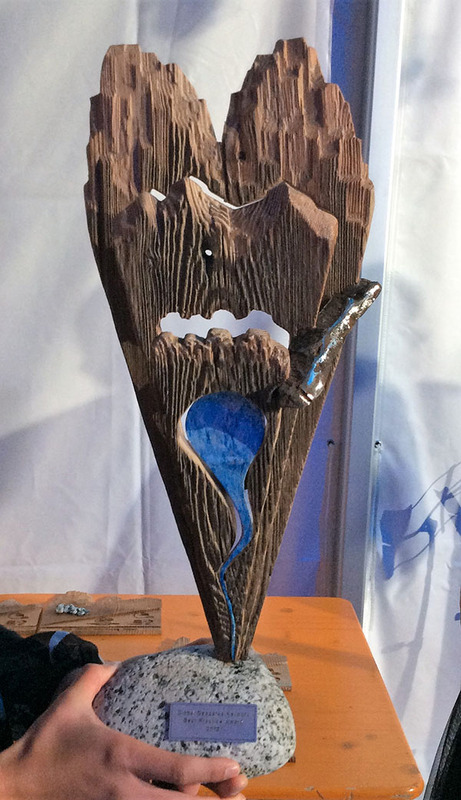 According to the Evaluator’s observation the Geopark is collaborating with the Geo-bakery which In his showcase, exposes not only his ammonites-like bakery, but also original fossils and fragments of petrified trees. There are diverse photos and other artefacts related to the local geological heritage on the walls of his bakery. This geobaker is managing also a small but very rich Ethnographical museum, which dwells except many authentic local relicts also some paleontological samples. He is not only good geoheritage interpreter and storyteller but he also serves as a geoguide in the Basconcillos del Tozo surroundings. The baker, person with the admirable amateur palaeontological knowledge, incredibly positive energy and contagious interest in geoheritage, plays a very important role of geopark ambassador and example to follow. All that is enabled by the continuous support, advices and expert information provided to the baker by the enthusiastic and very professional team of the Las Loras Geopark team. According to the Evaluator’s observation Sierra Norte di Sevilla UNESCO Global Geopark offers a good example of collaboration between the Geopark management and the local communities, especially supporting and encouraging the development of tourist activities on the natural heritage and the geological heritage of the area. We are impressed by the strong connection between the Geopark and the local tourist guides. There are several enterprises partner of the Geopark, which realized guided tours within the Geopark territory focucing on geology and mining heritage as well as to the nature environment. The training of how to provide the scientifically correct information in a visitors’ friendly way is an example of best practice. The educational activities provided through the Geopark info-centers and specifically the educational program “Nature and You”, which is developed by the Ministry of Environment and Spatial Planning with main objective to bring students from our community centres to the natural environment, facilitating the knowledge and dissemination of their heritage in another good practice of the Geopark.